Kikuchi–Fujimoto disease is a benign disease of self-limiting course characterized by lymphadenopathy that is often mistaken clinically as lymphoma or infectious lymphadenitis. To prevent such a mistake, a clinical and pathological correlation is recommended. 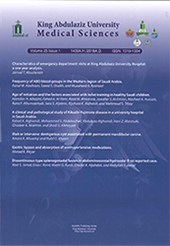 In this retrospective study, we are documenting the clinical and pathological features of this disease through the last 15 years (2001-2016) in King Abdulaziz University Hospital; and comparing results with that of international findings. From a total number of 1805 lymph nodes sent for histopathological examination during that period, only 9 cases had been diagnosed as Kikuchi–Fujimoto disease. Three (33%) cases were 20 years old and under; five (56%) cases were in the ages between 20 to 40 years old and only one (11%) was above 40 years old. Eight (89%) cases were females. Regarding the outcome, all cases showed complete recovery and there was no recurrence. Only two histological phases were seen, namely proliferative and necrotizing phases.